Anodized， Polished Or Not Polished. 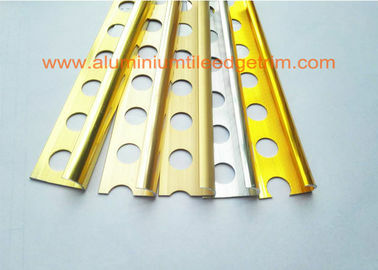 Aluminium trim strip are especially designed for protection of tile edges. They can used for all domestic and commercial areas. Because of their strong aluminium material, they hold an advantage over PVC trims for providing edge protection in areas where permanent and strong stresses occur. 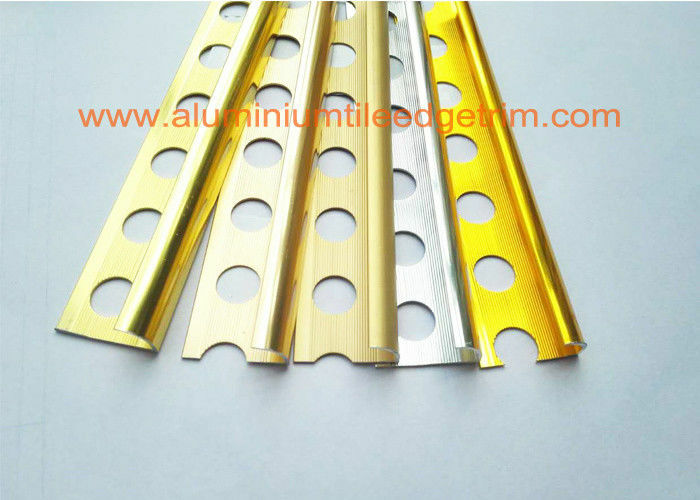 These aluminium tile trim profiles are designed to transfer impact stresses uniformly into the tile covering and base material. 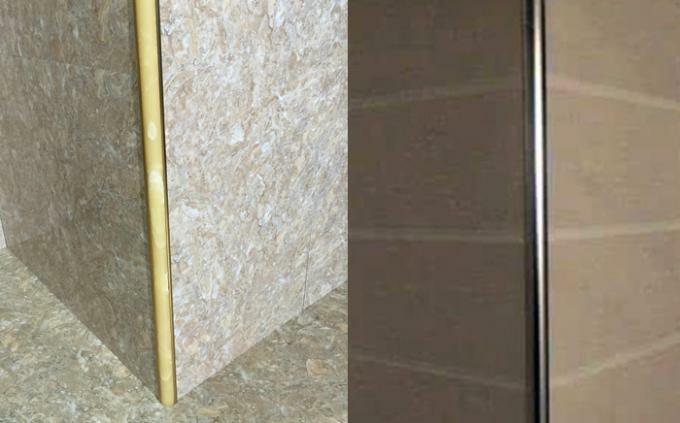 Aluminium tile trim strip helps to minimise the chance of damage occuring to the decorative covering. Aluminium rounded edge profiles also meet the highest quality decorative requirements, providing clean transitions between surfaces. The aluminium curved edge tile trim strip in particular is also ideal for corner edge protection. Our factory can manufacture different color as different clients' requirement. The following color are hot sale color, such as shiny silver, anodized silver, shiny gold, anodized gold, polished silver and polished gold, matt gold, bronze. If our factory has not the color plate you like, just offer your samples. we can manufacture the same color as yours. Our factory is one of top professional manufacturer of aluminum tile trim in Foshan City, Guangdong Province, China, with complete industrial chain, including extrusion workshop, punching workshop, anodizing workshop, powder coating, thermal transfer printing workshop, and packing workshop. Our manufacturing base covers an area of 20,000 square meters with nearly 200 employees. At present, our output every month is 300 tons, which is still growing. With a variety of shapes, our aluminum tile trims has covered over 30 countries and regions all over the world. 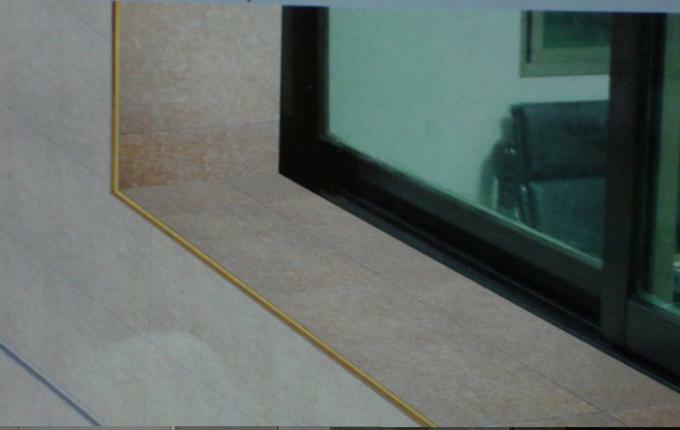 To avoid being scratched by ceramic tile corner, and protecting ceramic tile corner from damage, it is necessary to install aluminum tile trim for ceramic tile corner. What's more, It plays a part in interior decoration.If using aluminum tile trim, it can add metal line view, which makes luxurious for the whole space.